Nvidia is promoting Bandai Namco Entertainment's Ace Combat 7: Skies Unknown in a recent post on the GeForce Blog. We covered this game in the HEXUS news earlier this month, as a great looking Sony PSVR version of the title was teased at the Tokyo Game Show. While there was nothing mentioned by Nvidia regarding a VR version for PCs/Oculus/Vive, it has shared the first 4K video demo of the game (recorded on PC) alongside a developer interview. Furthermore, it has shared the Nvidia-flavoured PC system minimum and recommended specs to enjoy Ace Combat 7: Skies Unknown. 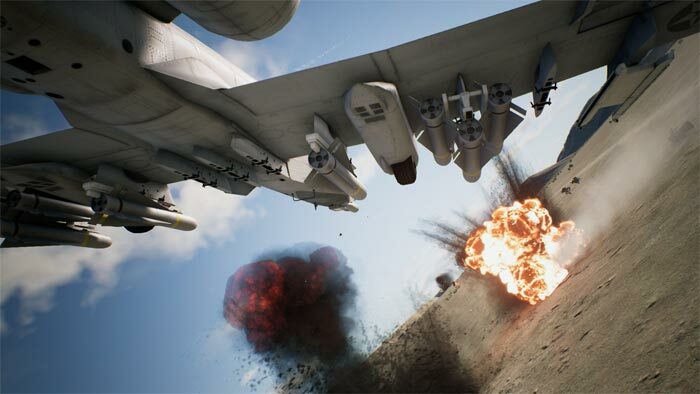 In the tech talk above you will hear Kazutoki Kono, Brand Director for Ace Combat 7, reveal that the new game is rendered with 8K supersampling in this PC demo, then downscaled to 4K. The faster your PC the better, we are told, as there is also an uncapped frame rate on PCs. Another new detail is the way that clouds are more realistically rendered and can provide cover for you, or your enemies. In Nvidia's video the settings are maxed out with "options for Anti-Aliasing, Bloom, Effects, Motion Blur, Post-Processing, Screen Space Reflections, and Shadows all cranked up". On PC you will have lots of choice with regard to controls, with the developers catering for Flight Systems, controllers, flight sticks, keyboard and mouse control, and key remapping. Nvidia implies that the 4K demo video was recorded on a GeForce GTX 1080 Ti and ran at a steady 60fps+. If you don't have this level of graphics card performance, the configurations tabulated below will get you 60fps+ in 1080p and 1440p respectively. 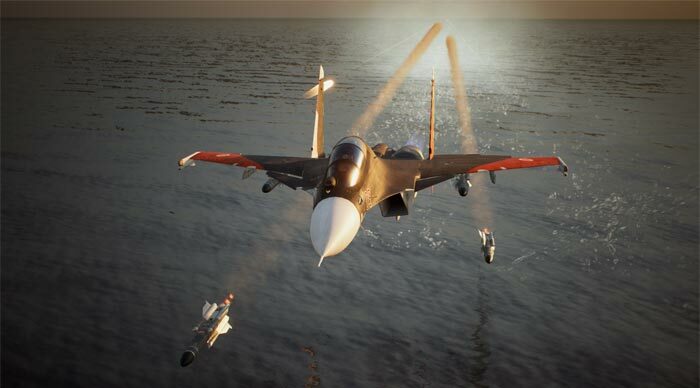 Ace Combat 7: Skies Unknown is released on PC in February next year. There are pre-orders open on Steam right now, with some bonuses for the faithful. Meanwhile, for those who prefer (mostly) ground-based speed thrills, Codemasters has announced Dirt Rally 2.0 is in development. The game will feature six rally locations around the world (New Zealand, Argentina, Spain, Poland, Australia and the USA), and eight official circuits from the FIA World Rallycross championship, driving modern and historic rally cars. While the original Dirt Rally was PC only, Codemasters have gone multi-format this time around. You can get an idea of the game in action in the video above (video plays at up to 1080p 60fps). Codemasters says that the gameplay includes a new authentic handling model, tyre choice and surface deformation. In the game you will be able to develop your team and cars around race strategies, and progress through a varied selection of Events and Championships in both a single player Career Campaign and a competitive online environment. 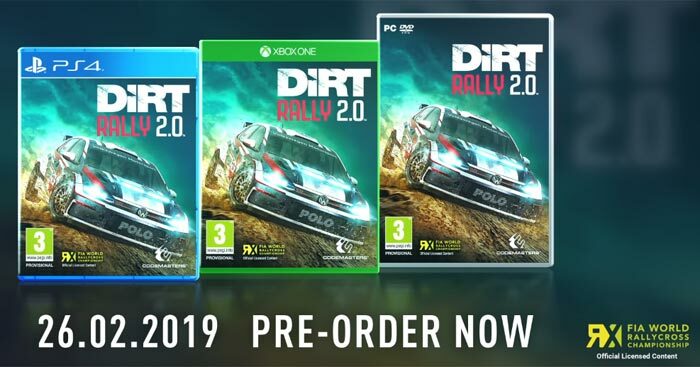 Dirt Rally 2.0 will be available from 26th Feb 2019, but you can pre-order now if you wish. I hope Codemasters do a better job on this than the first one. Really wanted to play it but it doesn't work with high core count systems and so I had to get a refund from Steam for the first time ever! I have Dirt Rally and run a i7 6950X 10 core and it works fine. DX v11 in pre W10, doh ! is it 100% stick only?